Before the Victorian Embankment was constructed, the Strand was once a river road connecting London to Westminster. During the Elizabethan period and into the reign of James I, great mansions were erected along this route with gardens that stretched down to the river. At the corner of the Strand and Whitehall, at a small hamlet called Charing, Henry Howard, Earl of Northampton, built the largest one in Jacobean style. Its principal feature loomed over the Strand–a three story high frontispiece topped by a high parapet. It looked like it was designed to hold a Bavarian glockenspiel. A Fleming, Gerald Christmas, was allegedly one of the architects. He left his mark on the front portal of the house by embedding his initials in the stonework. Scarcely a decade after the house was built, this stone fell and killed a young man standing below on the Strand, watching Anne of Denmark’s funeral procession. When the Earl of Northampton died, the house passed to another Howard, newly created Earl of Suffolk. The river mansion became known as Suffolk House, but not for long. A daughter married a Percy and took the residence with her as part of the marriage settlement. Henceforth it was called Northumberland House. 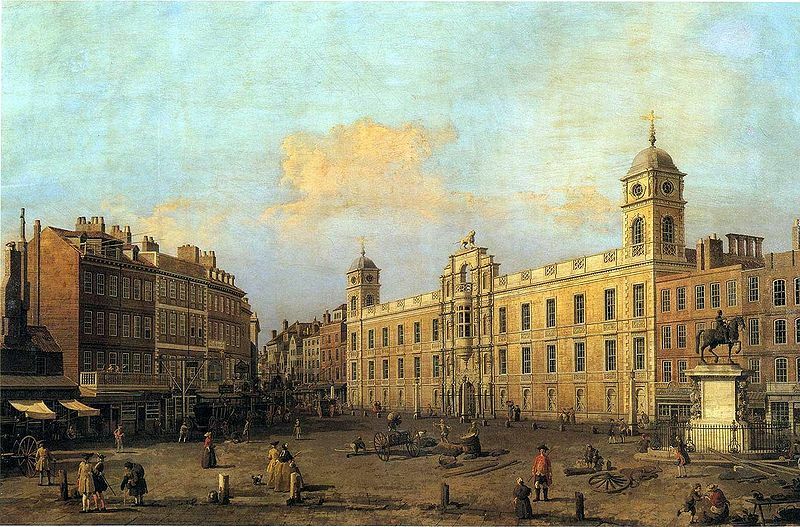 In the middle of the seventeenth century, the river mansion was given a fourth side along the river to complete the enclosure of its quadrangle. This was the new entrance and where the main living areas were moved, away from the noise and dust of the street side. Great stone stairs were constructed leading from the dining room down to the riverfront terrace and its verdant gardens. The house was to pass to her daughter, who married a man with the pedestrian name of Smithson. The new Duke and Duchess of Northumberland lived in great style on the Strand, expanding the house by adding on two Palladian wings, one of which contained a picture gallery: “(a) sumptuous chamber,..might have been in better taste,” wrote Horace Walpole. Oh, dear. Topping it all was the Percy lion, a cast iron sculpture placed on top of the glockenspiel parapet, his tail outstretched like a handle. The Northumberland fortune increased and so did the house. By the Regency, it had a magnificent glass drawing room and a grand marble staircase, a final burst of magnificence before the family moved away to the more fashionable neighborhood of Grosvenor Place. Then along came Trafalgar Square in front of it and the Embankment behind, isolating the great mansion, although still beloved by the Percies. In 1873 the Board of Works demanded the Duke sell Northumberland House to make way for a street to the Victoria Embankment. There were other routes proposed, through lesser houses and considerably less ancient, but the Ministry had set its sights on putting the road straight through the house and its gardens. The house was handed over for 500 thousand pounds and the auction of what could be salvaged from demolition amounted to 6500 pounds. 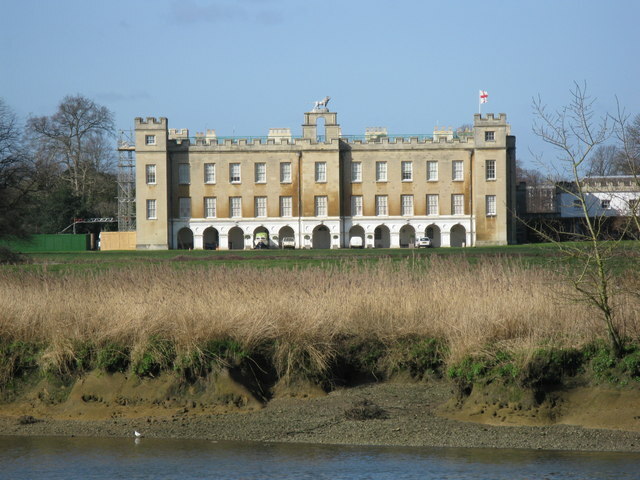 The lion is now atop the Duke’s suburban London residence, Syon House. see the lion at the top?